News around our magazine. For workshops, markets and more please view our facebook page! 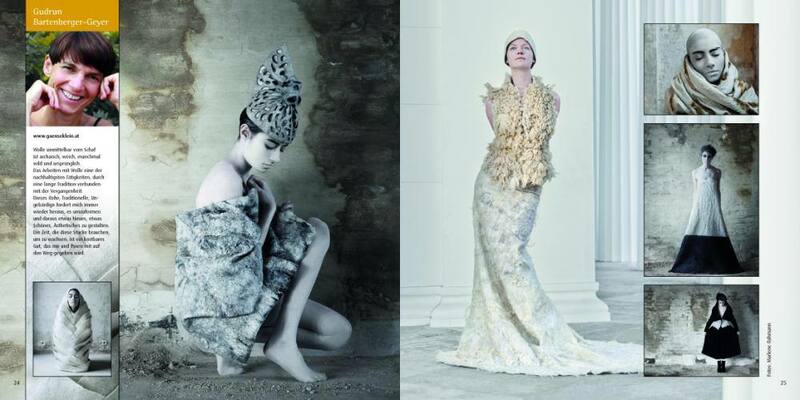 The verFilzt Und zugeNäht readers gallery has got their own section on our website! 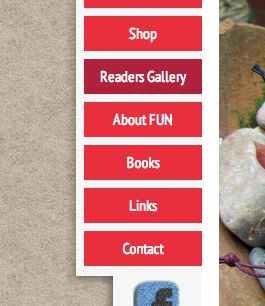 Now you can access all previously published galleries by clicking on »Readers Gallery« in the menu on the left side. To open a gallery just click on the first image. In the opened gallery you can navigate to the next image by clicking on the right side and to the previous one by clicking on the left side of the image. We would be delighted if you would join the next Readers’ Gallery! 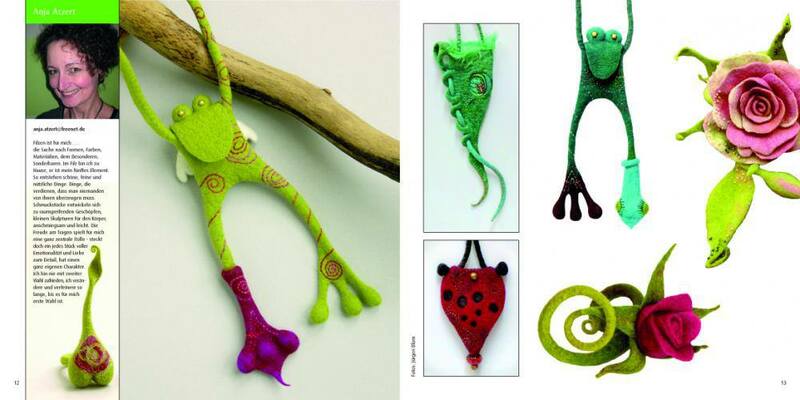 Send us a photo of your latest felted work in high resolution to lesergalerie@filzfun.de. Enjoy watching the readers galleries! The inspiration for this dress came from the necklace that I made first. I have made some strips of prefelt that are laid on the table first (see two lines on the dress perpendicular to all the strands). Then made more than a thousand wet and thin (and quite long) strands of wool. 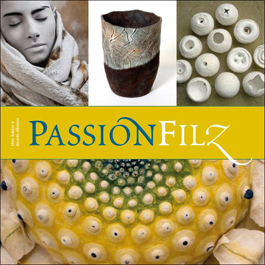 In PassionFilz felt creations are displayed from German-speaking felt makers. The book has the format of 21x21cm. 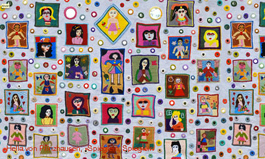 All 93 authors display their great creations on a double page, together with a portrait about themselves, contact information, and a short description of their passion for felt. You can find objects, wallhangings, clothes, interior design, figures and much more in the book. 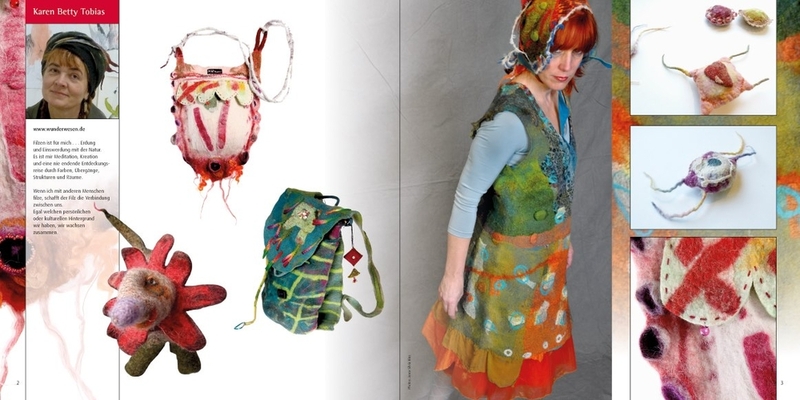 A book full of surprises, that represents the german-speaking standard of felt art. PassionFelt is a cooperation of Ellen Bakker (textil-link) and Ricarda Aßmann (Author or the book FilzFrauen). 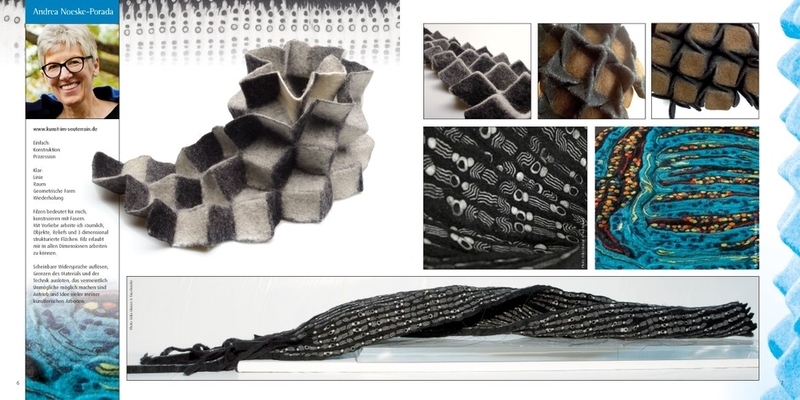 For more information visit the website of textil-link: Here. The Afghan project (the FUN reported) has its own homepage now. 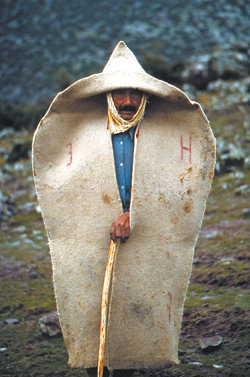 You can browse through many galleries and travel reviews and dive into the afghan culture. You can find background information about the embroideries, the stitches and so on. You will also find information about exhibitions, where the european culture meets the far East. You can also order and buy the newest embroideries on the website. Pascale Goldenberg, the organizer of the project published her book threads unite in the MaroVerlag. You can order it in our FUN-Shop. Writing book reviews you normally do not get to meet the authors themselves. That I would sit for about 3 hours in the living room of the authors couple to chat with them was not planned but illustrates how meaningful it is to meet theses two! They reported full of excitement about their adventures and research in the Orient. 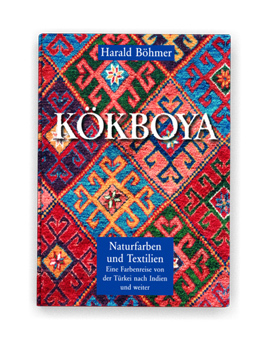 A friend of mine suggested their book »Kökboya« to me, she told me that she had read the entire book even though she was not planning to dye with natural colors any time soon. The book is a master piece! 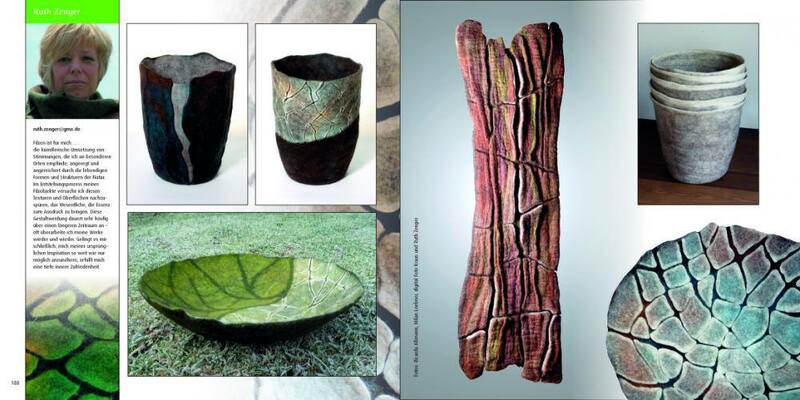 The book displays pure passion for natural colors and the ambition of the authors, to not only write about recipes and plants but to include extended chapters on colors, textile fibers, textile techniques and so on. In the next issue of the FUN you will have the chance to read a full review on this wonderful book. We are absolutely fascinated by the 300 pages in the book. 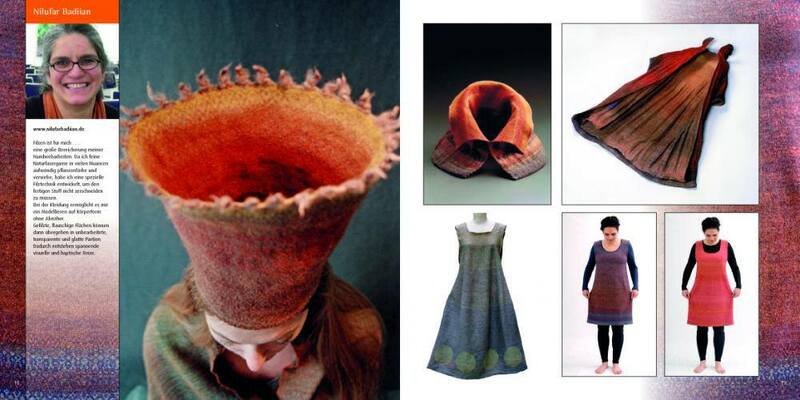 We think the book is great for anyone who loves textiles or the tradition of dyeing with natural colors. You can order the book »Kökboya« in our Shop online. The married authors have published the book in their own publishing house, we will collect your orders, pick up the books at Harald Böhmers office and deliver them to you.